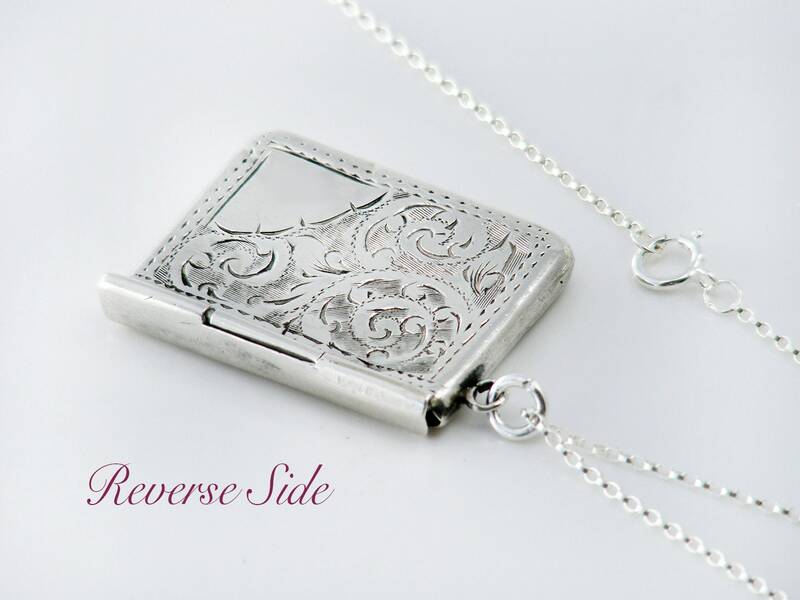 A silver envelope locket that was originally a stamp holder attached to an Edwardian chatelaine or pocket watch fob, this is a fabulous piece. Hand chased with an ornate acanthus scroll pattern and the back has a blank corner cartouche ready for a special initial. 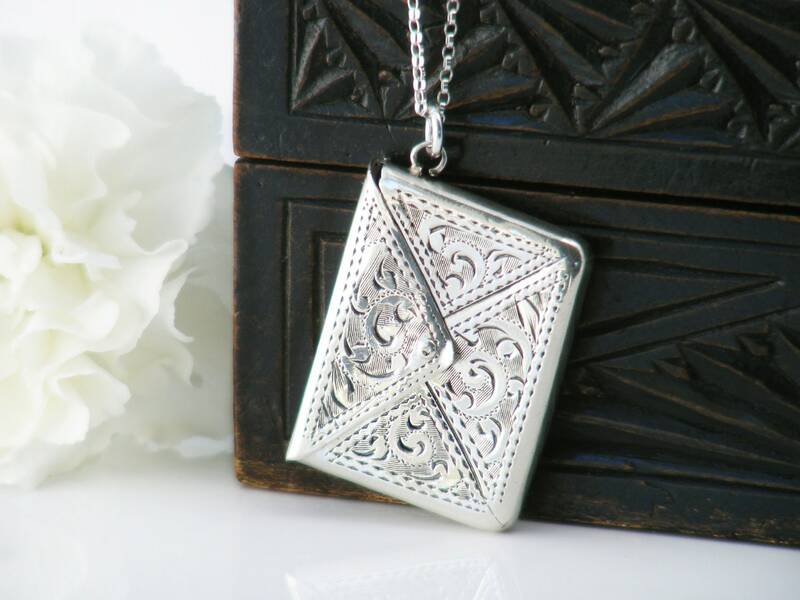 The locket is suspended from a corner and has a hinged 'envelope flap' that clips secure shut - wonderful for holding a special love note, inspirational prayer or photograph. 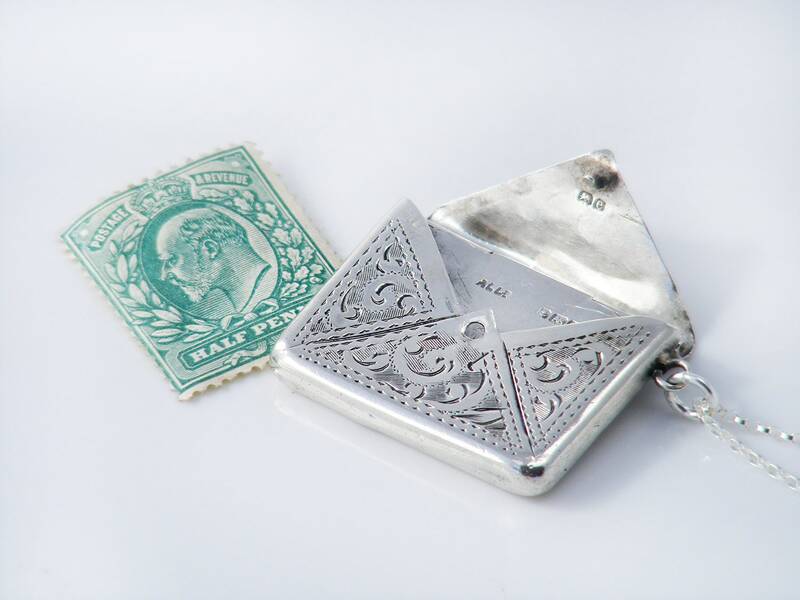 The envelope is hallmarked for sterling silver, the assay office of Birmingham, England and the year 1904. 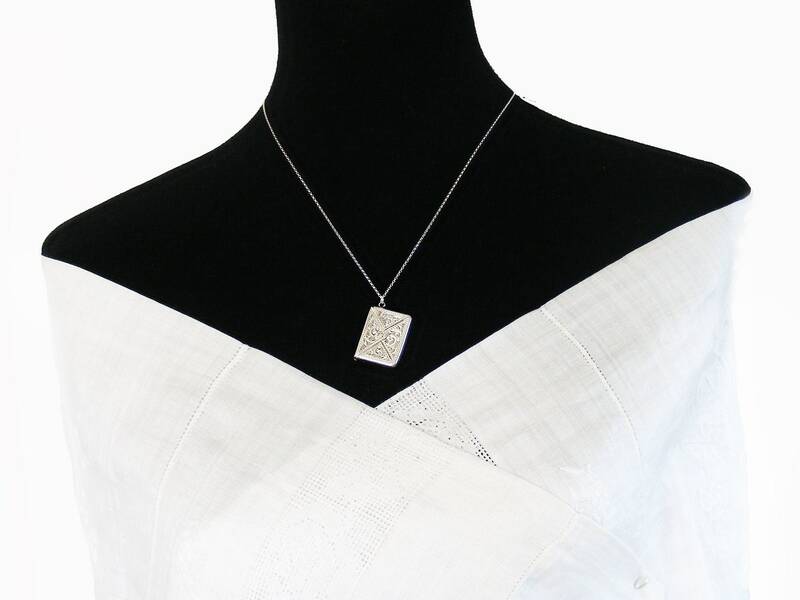 The maker's mark 'ALLD' for the renowned silversmiths Adie & Lovekin Ltd is present and crisp. 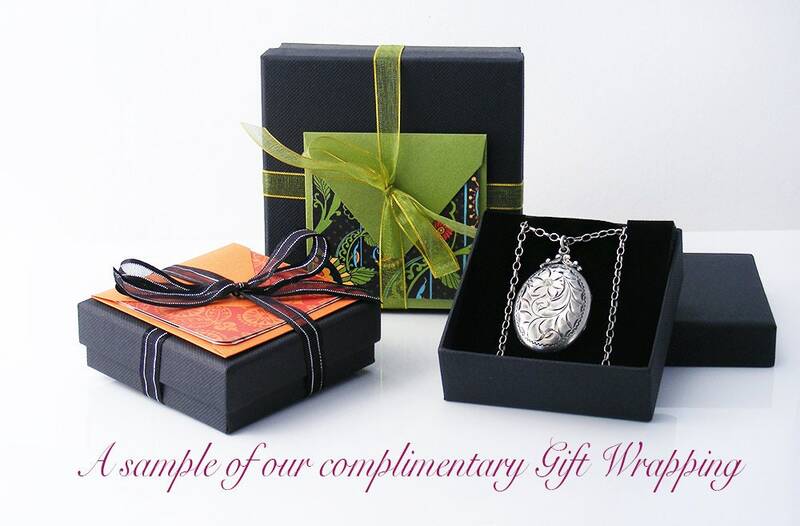 Size: .85 x 1.15 inch or 22 x 29mm in size, approximately 4mm in thickness. Condition: Very good but has several small dents and price has been lowered accordingly. Closure snaps into place firmly and the hinge is very strong and working perfectly. Age: 1904 -115 years of age. Presented on a new suspension ring and 20 inch or 51cm sterling silver chain, stamped 925 to the clasp. Shown on a life size torso in image #4. 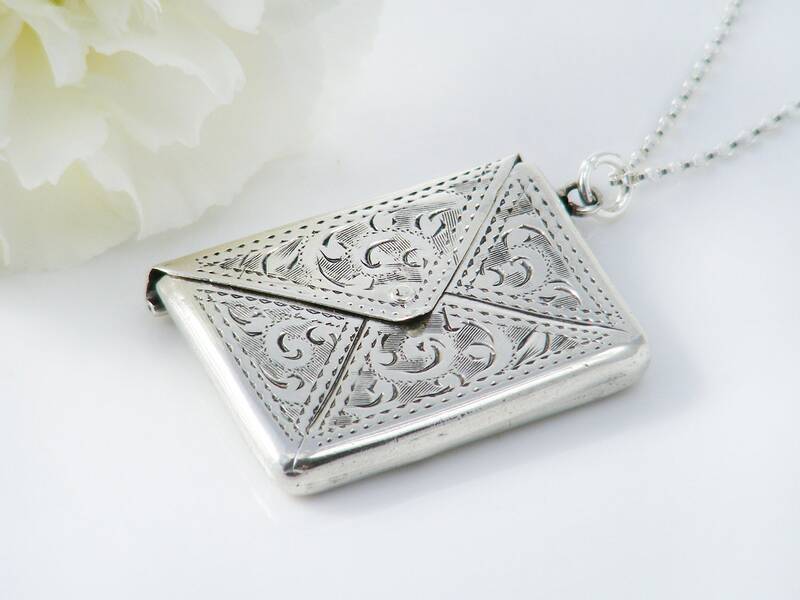 Edwardian silver stamp envelopes - useful, fun and very beautiful as a locket. This example from my favorite English silversmiths, Adie & Lovekin.